Firstly, for those who don’t bother themselves with memorizing the bizarre Tex-Mex chimeras that Taco Bell churns out, a Quesarito is a combination quesadilla and burrito – a soft burrito wrapped in a layer of cheese sauce, with another tortilla around it all. In the case of the Volcano Quesarito, this cheese sauce is replaced with the Lava Sauce. The Volcano Quesarito is actually pretty darn good. We’ve never had a Quesarito before, and were surprised to learn just how simple they really were. 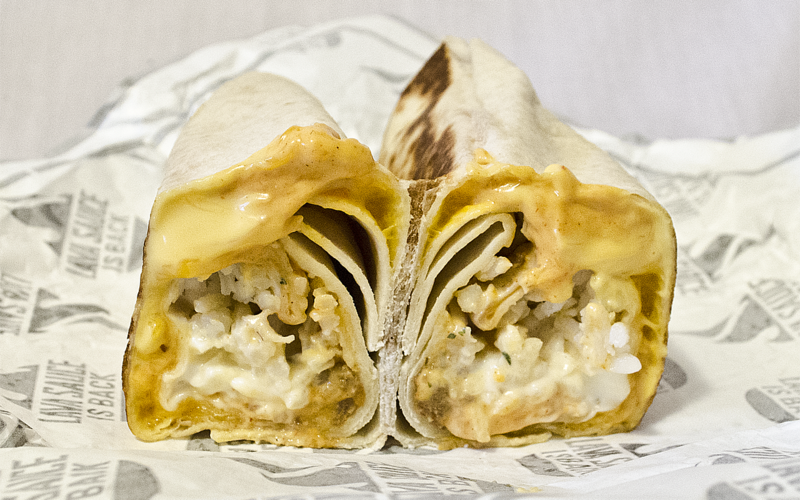 It’s just beef, rice, sour cream and cheese sauce; the double-wrapped and grilled “quesadilla” aspect is nice, but it’s merely a gimmick. The Volcano Quesarito’s individual aspects all managed to stand out on their own, for the most part. The sour cream, in particular, worked very well. 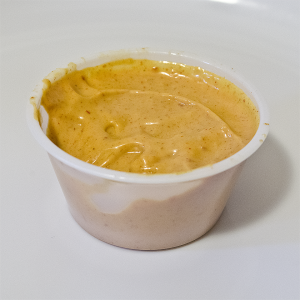 We’ve established before in the Grilled Stuft Nacho review that nacho cheese and sour cream is an excessively wet combination, but with the heat from the Lava Sauce, the sour cream added a perfect cooling balance. The rice was another favorite – Paula loves Taco Bell’s rice in all applications, and even though Bill isn’t always a fan, we both agreed that it tasted very good in here. 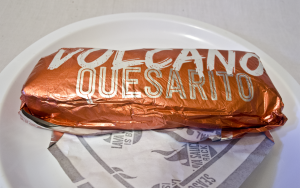 Our primary problem with the Volcano Quesarito was that it was very, very soft and wet. There was no crunch, aside from the grilled tortilla which quickly soaked up excess Lava Sauce. This led to some spilling, and though normally we feel like Taco Bell’s red strips are unnecessary filler, this time they felt like they would have been a huge boost in the right direction. 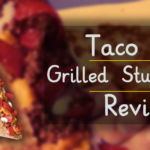 But we all know that this review isn’t really about the Volcano Quesarito. It’s about what this whole promotion is really for: the Lava Sauce. 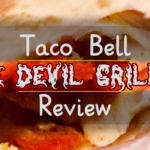 Taco Bell has had a wide variety of sauce-themed releases in just the past year: Diablo Sauce was released on the same day as a free Biscuit Taco promotion, encouraging tasters to try it on their otherwise limp and flavorless breakfast food; the Dare Devil Grillers were the star of their limited time offer, narrowly overtaking the sauces themselves. So it’s not unexpected that this promotion would be focused on the return of the sauce, not necessarily the item it’s bundled in. 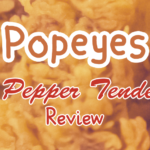 That said, the comparison to the previously-mentioned Dare Devil Sauces did affect our perceptions: the Ghost Pepper sauce still remains one of the spiciest fast food offerings we’ve ever tasted. Would the Lava Sauce stack up to that? Well, “Lava” was the right word to describe the taste of it – a slow fire that crawls across your tongue, burning everything it touches. It was very spicy, and had a really good cheese flavor to boot. The heat level was somewhere between the habanero and ghost pepper Dare Devil Sauces – not too hot, not too mild, just right. However, we have to admit that spicy nacho cheese isn’t the most exciting thing in the world. It’s delicious, sure – but is this what Taco Bell fans have been gnashing their teeth over for years? Online “recipes” often suggest combining a cup of nacho cheese and Fire sauce, and that’s not too far off from what this tastes like. Since it’s extremely unlikely that Taco Bell would reformulate it to make it taste worse, it’s likely that Taco Bell fans are once again overstating how great a discontinued item was. Both burritos were indeed enhanced by the addition of Lava Sauce! The Beefy Fritos Burrito was the most enhanced, as the crunchy Fritos and cool rice combined with the flavorful Lava Sauce made an extremely satisfying spice experience. The Cheesy Rice and Beans Burrito wasn’t improved as much, as the presence of nacho cheese in the burrito itself made for a bit too much cheese (if there ever really is such a thing), but it otherwise added a great flavor. This is all great and fun, but it seems a bit ridiculous to have to custom-order these things. Where is the rest of the Volcano menu? 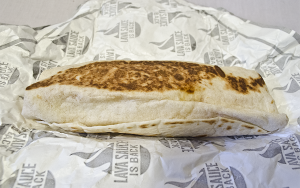 Although Lava Sauce can be added to any menu item, the original Volcano menu had substantially more items and no Quesarito in it. What good is having lava without the volcano? (How else are we going to get our bright red taco shells now?) The promotional Volcano Quesarito Box doesn’t even put Lava Sauce on any of the tacos. How disappointing. 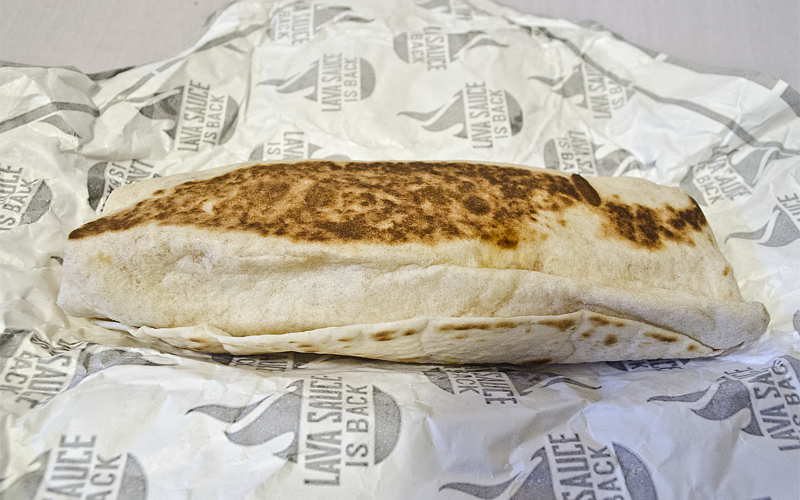 We may never know exactly what it was about the original Lava Sauce that made it so popular, but we welcome its return with open arms. 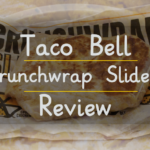 Although it wasn’t exactly everything we were expecting it to be, it’s still an amazing sauce in itself and we will indeed be slathering it on everything we order from Taco Bell in the foreseeable future.